The month of January was filled with visits from my grandparents granny and paw paw Brown. There were a few excursions to the beach for some salt air and relaxation. I continue to suffer with seizures on a constant basis. In December right before Christmas, I found out that the company Liva Nova who makes the pacemaker of the brain (VNS) had said that they would donate the device. My mom had been searching and calling for a month and talking to different representatives of the Epilepsy foundation she had told many family and friends what I was needing. One day granny called and said that my Uncle Rob had spoken to his neighbor Mrs. Sandy Black. Rob explained how terrible my seizures had become and that I had tried everything out there in regards to anti epileptic drugs. I currently take three now. It turns out that Sandy is the Vice President of the product modulation department at Liva Nova. Sandy told Rob she was going to try everything to make it happen that I get the device. The VNS device here in Costa Rica costs $25K. We were all so happy we were crying. Am so grateful to my uncle Rob for investigating for me and helping me to get this device.. The most amazing thing is that here in Costa Rica we have a pediatric surgeon and another doctor that can calibrate the device! So exciting, we hear from other moms that is has helped tremendously in the reduction of seizures and the intensity. Would sure be great if I could have less of them! Keep me in prayers that it all works out smoothly. Finally after all these years we are making a family trip into the city to have some fun! We left the house on Thursday morning and headed to San Jose. 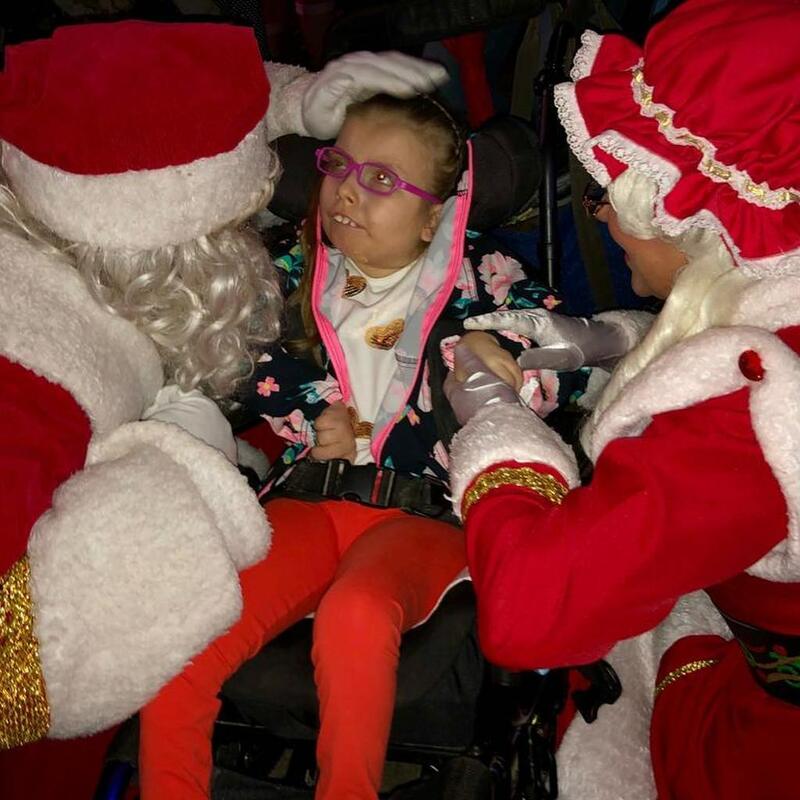 Today is the annual tree lighting at the Children’s Hospital. This makes our third year to go! The hospital always lets us go in through emergency and we get to go behind the scenes and sit right by the tree. Many many people come to see the tree lighting plus there is a huge show with music and dancers! This year we cut it a little close, as I did have one last minute appointment at 5pm. We went to see neurologist Dr. Sittenfeld. He is the neurologist who knows how to calibrate the Vagnus Nerve Stimulator. Mom had spoken to the representative Gabrielle Cayama at Liva Nova and he had told us our first step in getting the device was to make an appointment with Dr. Sittenfeld. The doctor was very nice to me. Mainly mom was just filling him in on all the different types of seizures I have and asking if it would be possible to have the VNS surgery here. The doctor is going to help us and will be writing a letter for us so that maybe we can get the VNS device donated a mere $20,000 device! Dr. Sittenfeld said he would be happy to donate his services and time as well.. So fingers crossed!!! We rushed to the children’s hospital and made it just in time to see the tree lighting! There are 25,000 lights on the tree, it is amazing to see when they turn it on! I was quite fascinated with it and of course getting to see Mr. and Mrs Claus.. They are always so sweet to me, Santa always whispers a secret in my ear! This year the local news came up to us and asked to interview us. 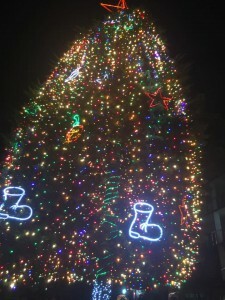 They were impressed that we came all the way from Delicias just to see the tree!! We had a great night! I was pretty pooped from the trip and all super stimulated from all the excitement but wouldn’t change a thing! It is our family tradition and a fun one! The following day we went to the park that we always drive by and say we are going to go one day. Since I didnt have any doctors appointments we went and strolled around the lake and it was a gorgeous day and so nice to be out! Getting super excited as today my two best friends are coming into town to see me and we are going to the ballet!! NOVEMBER IS EPILEPSY AWARENESS MONTH! Proudly wearing purple the color for Epilepsy. What Malia has been through in the last two months has been almost unbearable to watch. Malia, our little bull, who has struggled with epilepsy since she was six months old has always battled the seizure monster. She’s has had decent control, but recently the seizure monster came back with a vengeance. In six weeks she has been hospitalized for status epilepticus. ( seizure that will not stop after rescue meds and requires IV drip infusion of drugs). We have watched her suffer up to 200 seizures in one day. We have tried five different drugs. The CBD oil, seems to not be working for her anymore. What we thought was a routine 2 day visit in San Jose two weeks ago ended up being 12 days. We came home Friday, as Malia showed slight improvement with this latest new drug. We tackled the weekend fighting the seizures again and again. Thankfully Roxy was with us in San Jose and a big help during this time. We are currently searching for the Vagnus Nerve Stimulator Device and hopefully will be able to buy it for her, a mere $15K. Her neurologist here is speaking with a Pediatric Neurosurgeon tomorrow to see if he is willing to do the surgery privately as she is not a candidate for it at the Publicly Funded Children’s Hospital due to the extent of her prognosis. On a positive note, today she had one of her best days in months, the smile was there and the twinkle was back in her eyes. Little Bull, fights a very tough fight. She has our upmost admiration. She is a true warrior. She has an old soul and not only the tenacity of a bull but an OX. Our family is stronger because of her. Our faith is strong, and our belief that good will overcome the evil seizure monster. Our will and drive to continue to fight for Malia will never falter. Please continue praying for Malia. She needs all the prayers she can get and to return to the control she had months ago. Thankfully after taking the antibiotic that mom brought for my SIBO flare up I began to feel better. I was able to relax and sleep a bit. I have not been sleeping much at all due to being uncomfortable with my tummy. 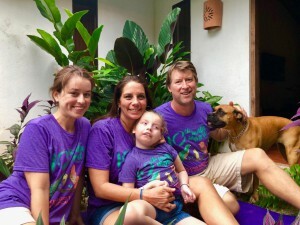 My gran mal seizures were on the rise and the night before we flew home to Costa Rica I had three of them again. We were all a little anxious about the travel day. We have so many things that we travel with and more than anything mom and dad were just praying for no seizures, nor me getting upset over my tummy. Besides the flight being delayed for an hour, due to weather, everything went great. I was such a trooper on the plane. I did not have any seizures, I didnt sleep either but at least I was comfortable in my seat. We had no problems at the airport and loaded up ALL our stuff in a taxi van and off to Krystal’s we went. We arrived late that evening. The following day was a rest day, and we were scheduled to go home Friday. That night I began to have a seizure and it would stop then start again and this went on for a few hours until mom wrote the Dr and decided it was time to go to the hospital as I really could not get the seizures to stop on my own. Off we went to ER, I was administered Dilantin via an IV and Diazapam. I drifted off to sleep, and we stayed in ER for 7 hours, Dra. Castro came down to check on Malia, and we all decided that it was best for me to stay the night and be monitored. I slept most of the night. The following day we stayed until 5pm I was having spasms but not like before and since the IV popped out and there was no other way to administer drugs except orally we decided to leave. We went to a hotel across the street and stayed the night. The plan was to go home Sunday. I did pretty good that Saturday night and we headed for home Sunday morning. Not sure what has caused the regression of this type of seizure. Could it be the antibiotic I was taking?? Hoping that is goes away and never comes back! We caught the morning ferry and we were home by 1:30pm.Boy was I so happy to be home… Finally my own bed!